As a state partner of the United States, Puerto Rico enjoys political and economic benefits that allow them drive their development. However, the island remains mired in anachronistic electoral system in operation and regulation, that sets the country apart from the progress made by the United States. Due to this situation, the current government is pushing for a thorough reform in electoral matters, which among other things introduces electronic voting. They are expecting to start using the technology in the 2012 general elections. This November 28th will be the first time that Switzerland will use electronic vote. Beyond the controversial issue to be submitted to referendum (automatic deportation of foreigners who commit crimes), the importance of this new electoral process in the European country, is that this nation has endeavored for years to exploit at maximum the benefits that technology provides to Democracy. With proven expertise in on-site electronic voting (the franchise is exercised in an electoral college), the Swiss system jumped to remote voting, and this Sunday will allow its citizens to express themselves from their home or anywhere with Internet access. This will allow the citizens, not only in the country, but the ones abroad, to exercise their democratic right. The system, successfully tested between 2000 and 2005, made possible that even before completing the pilot projects, the legislation was approved (2002). According to the electoral body that governs each canton (state or province), the online scheme or e-vote, allow voters to receive, through the postal service, their electoral material and a six-digit password. 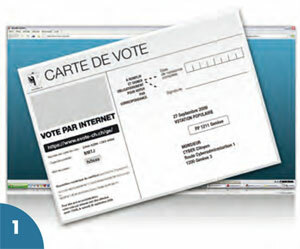 Connected to the designated website for the process, the voter enters its password to access the ballot and cast the vote. However, for this to be validated, the citizen must indicate its date of birth and transcribe a secret four-digit code contained in the vote documents each person receives. A final safety mechanism is that the voter states its commune of origin. In the last elections in that country (2009), only in Geneva, 5% of voters went to the polls, while the rest opted for the online vote. Another innovation of the electoral process is that the Swiss citizens that live abroad (190,000), will have the possibility to use electronic means to exercise their political right in this referendum process. Switzerland will dictate a lesson this Sunday on electronic voting, as it has not only tested it, but continues conducting research to improve voting technology, and showing that all changes can be approved by its citizens. In this European country any changes in the law or the Constitution can be submitted to popular approval by referendum, if at least 100,000 signatures are collected in an 18 months period. That was the case of e-voting, which was victorious with 70% of the vote in Geneva in 2009 and now is ahead in the rest of the cantons and communes.